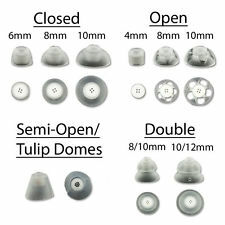 The click domes come 12 to an order. The most common size is the 8mm or 10mm. Measure across the bottom in millimeters to find your size. The open dome has openings around the dome. The closed dome has no openings around the dome. Also fits Rexton, Costco, Hansaton, Miracle Ear.